I think fall has to be my favorite season. Not only can we start wearing cozy sweaters and soft leather boots, but fall food is basically comprised of “comfort” food: donuts, apple cider, hot soup, cheesy pasta… God, I can feel my saddle bags growing by the minute! Blissful. These cupcakes are truly delicious with this frosting but if you wanted to leave the frosting off you could easily call them muffins and eat them for breakfast. Or you could eat them for breakfast with the frosting. Ain’t no shame. In a large bowl, blend bananas and sugar with an electric mixer. Add in eggs one at a time and blend until completely combined. Add vegetable oil and blend until the mixture is completely blended, about 2 – 3 minutes. In a small bowl, whisk together the flour with the baking soda. Add to wet mixture and stir with a spoon to combine. Add buttermilk and stir to combine. Line a cupcake tin with paper liners. Fill each cup about 3/4 full. Bake for 25 – 35 minutes or until a toothpick inserted in the center of one cupcake comes out clean. Let cool completely before frosting. In a small bowl, beat butter with electric mixer. Add cream cheese and blend to combine. Add brown sugar and vanilla and blend to combine. 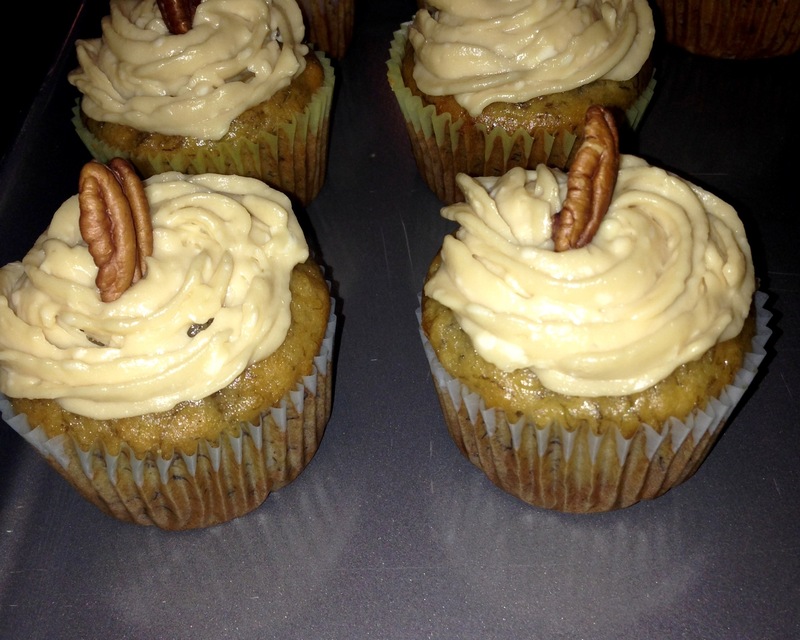 Frost cupcakes and top with a single pecan if desired. *If you don’t have buttermilk, combine 2 1/2 Tbsp of regular milk with 1 tsp lemon juice and stir to combine. Let sit for 5 minutes and then use as directed. Not quite. But today is warm and sunny in New York City (70 degrees!) and all I can think about is lemonade, ice cream, corn, grilled burgers and shrimp… It might still be March but my stomach says summer. 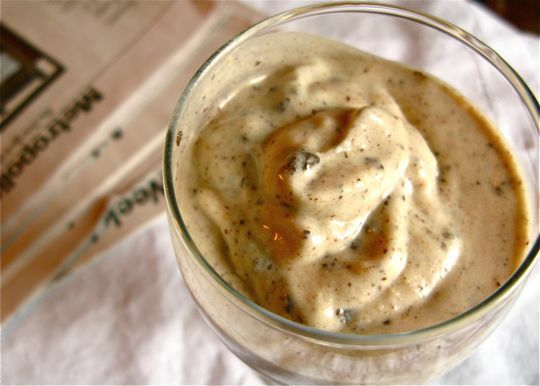 I’m blowing this popsicle stand early this week, but I leave you with this, dear readers: peanut butter banana chocolate chip milkshakes. You heard me. This is not my photo, nor is it my recipe (many thanks to The Kitchn for always supplying inspiration when I have none), but can you blame me for cutting and pasting this beauty? Fix a diving board to the side of that glass and I’d swim in it.